Rocco, 41, was raised in Bari, Italy, two hours south of Naples, and at age 16 took his first cooking job in his parents’ local Trattoria, making salsas, ragu, gelatos and other small-plate dishes. He worked there all during his early school days. At age 18, “I realized my true calling,” says Rocco, “and enrolled in Istituto Alberghicio Armando Perotti, which is the Italian equivalent of the famed Cordon Bleu cooking school.” After graduating, he worked on Ibiza Island, preparing meals for international tourists at the Golden Tulip, a fancy Italian restaurant and resort hotel. In the late ‘90s, he helped a friend from Capri open up “Rustico” a Restaurant in Telluride, Colorado, and after a few years he returned to San Clemente. In 1999 he began cooking at several local Restaurants and then opened “Meditrano” at the Country Inn in San Clemente which eventually closed with the sale of the hotel. In the early 2000s, he cooked at Carbonara’s, and while working there he met his future finance Belkis, who now serves the customers at Rocco’s. He was working at The Fisherman Restaurant when he bought the former Romance Restaurant at 201 N El Camino Real in early 2010. A wise marketing tactic for a new restaurant is to attract customers right from the start and that is why Rocco’s features a lunch menu with most items at $5. A favorite choice is the very generous Three Soft Tacos -- served with lettuce, pico de gallo and the choice of shredded beef, pork or chicken. Another favorite is Arepas -- traditional Venezuelan bread stuffed with shredded beef, pork or chicken. Fettucini Alfredo is only $6 and Linguini Diablo with garlic, olive oil, pancetta, in a spicy stewed tomato sauce (add meat balls $1.50 each) is only $7. The half dozen patrons queried said that they keep coming back for dinner. “It was the best meal I’ve had in more than a year,” said local Realtor Debbie Ferrari, chairperson for the Downtown Business Association’s cookbook of a few years back. She’d just enjoyed Paella Grata, which is Spanish rice served with pork, chicken, sausage, calamari, shrimp, sweet peppers and asparagus cooked in saffron broth. Wines stocked are Californian, and international, featuring choices from Italy, Argentina, Chile, France, Venezuela, and more. Beer is local and imported. Backing up Rocco, who works in an open kitchen so patrons can actually see him performing chef magic, is fiancée, Belkis, originally from Venezuela and a recent mother. Other staffers include Belkis’s brother Romulo and his charming fiancée, Daniele, along with a couple of Rocco’s cousins. 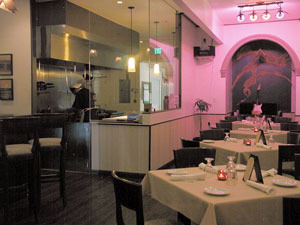 For reservations call (949)388-7766, or visit the website http://tinyurl.com/326qy3o .